EJ is the newer, smaller version of the ERIK650A. EJ stands for Erik Junior. 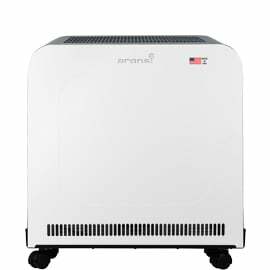 While it is smaller, the EJ120 has a strong CADR of 360 for pollen and is our quietest high performance air purifier. And it does this with only drawing 52 watts of power. We searched the world to build the ultimate air purifiers. In Germany we found the largest factory of high performance motors, just like a Tesla engine. So, you get high performance and reliability with low energy usage. Air purifier, filters, housing and electronics all made in USA. Simple controls with electronic 5 speed button to dial in the exact air flow. Don't need a manual to operate the unit. Latest German engineered motor is quieter and uses up to 90% less energy saving since it draws a max of 57 watts and delivers a high 384 pollen CADR air flow. How do you build the ultimate air-cleaning machine? It's simple; you combine the best filters with the best fan and make it in the USA. As allergy and asthma sufferers ourselves, we built the air purifier that we would want to use. Turn your room into a cleanroom! Air purifier housing, filter media and electronics all made in USA. Only mechanical filtration. No ionizer or anything else that could potentially create ozone. Merv 17 HEPA (99.97%+) performance. Proprietary carbon for advanced gas control. And it's super quiet. Silent on the first two fan speeds and on high much quieter than any other high-end air purifier. To ensure we can deliver the best air purifier we thoroughly test in the top labs. 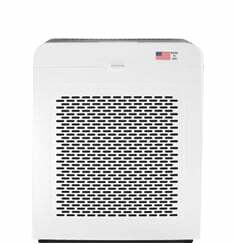 HEPA filters were invented in America and through engineering and rigorous testing in America we have improved the HEPA filters. 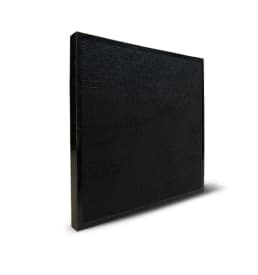 Carbon is widely used for gas removal however does not work well in humid environments or for formaldehyde so we developed a proprietary treatment to solve these problems.To ensure the highest quality and safety we make our air purifiers in America. 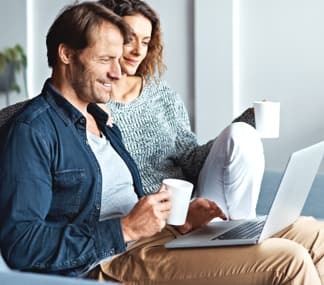 We are focused on improving the most important part of your life - protecting the health for you and your family.The EJ air purifier has two filters – a 1” deep pleated activated carbon filter and a 3” deep main HEPA filter. Effective for gases for smoke and gas leaks (methane gas, sulfur gases, and many others). 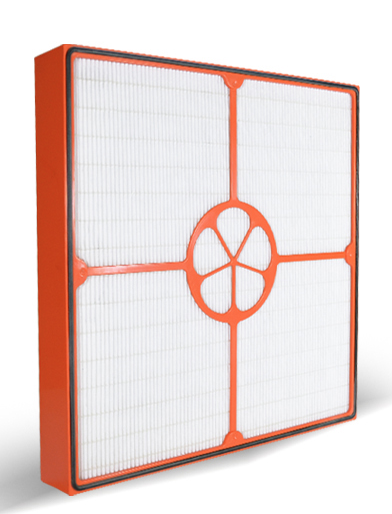 The main filter is the same industrial filter that is trusted by hospitals and removes much more than any true HEPA filter. 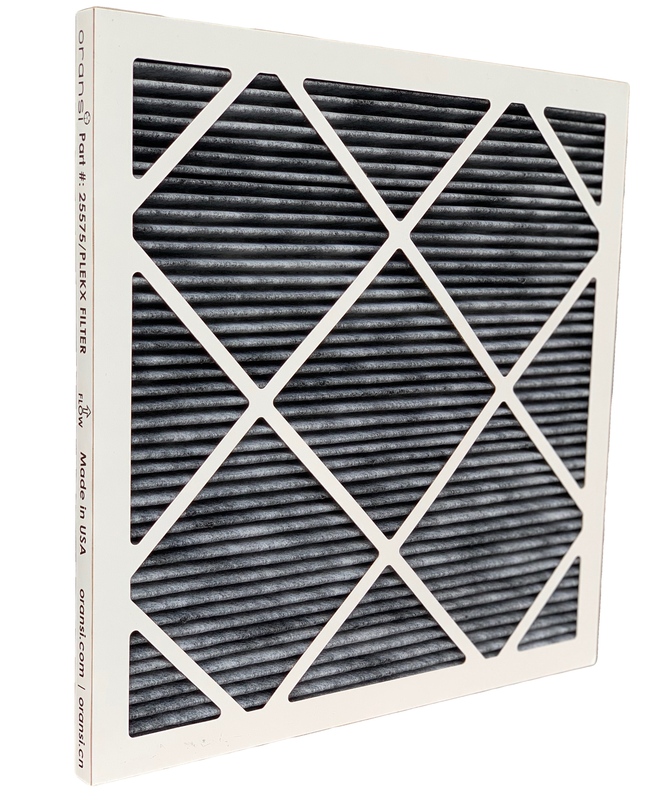 If you remove the filters, the white HEPA filter should be inserted first with the black seal facing inwards (in the picture below we show the seal so you can see it although be sure to place the seal facing in). This will ensure it makes a tight seal with the metal frame of the air purifier. The carbon filter is installed next and also acts as a pre-filter. So, when you open the front cover the first filter you should see is the carbon filter. 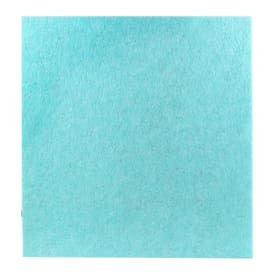 Having more filter media means the main filter will last longer (1+ years) and it creates less air resistance. By not having to work as hard the motor can spin at a slower, quieter rate. These are the same filters used in Hospital Operating Rooms, the Nuclear Industry, Containment units, Laboratories, and Pharmaceuticals. EJ (like our Erik series) has the best, latest German engineered EC motor and fan so it provides higher air flow while being quieter and using much less power. The EC motor is a much-improved technology over the traditional AC motor that nearly every other air purifier uses. AC motors use technology that was developed in the 1800’s and use more energy, can have an annoying hum, and are not as reliable. They are common because they are very inexpensive to produce. Placement - we suggest placing the air purifier in the room where you spend most of your time. For most this is a bedroom where the unit stays plugged in and runs 24/7 or whenever you are in the room. EC (Electrically Commutated) motors use electronics to convert the AC voltage to DC to run the motor. EC is the latest technology innovation whereas AC motors use technology from nearly 200 years ago. With an AC motor from China, chances are that the copper was wound by hand and the ball bearings are of low quality making it unreliable. EC motors are DC so they are more efficient and use up to 90% less power and in the long term can provide significant cost savings. Runs cooler so greater reliability. Has a proven track record in the telecomm and computer industry. No motor hum that you get with an AC motor. Why does the motor/fan start and stop more slowly than an AC motor? EC motors have a soft start programmed into the motor to limit the start-up current the motor draws (there are electronics built into the motor). The ramp down after power is removed is only a function of the inertia of the fan and the friction of the bearing system. A high quality bearing system will take longer to slow down and stop since the friction is minimized (alignment is better, lubricant is better, etc.). The humming noise comes from the fact that it is an AC motor and all the magnetics are changing intensity at the line frequency. When rotating, these forces are aligned so as to rotate the rotor. When the motor is not rotating or rotating at a speed lower than synchronous speed, they tend to make things vibrate back and forth and that makes the humming sound. If you have an AC motor that starts slowly, the humming starts louder and decreases as the rotor and field come into sync. Up to 1,250 sq ft with 2 air changes per hour. Learn more about air purifier room size and see AHAM Verifide results. Perfect for large home living areas, offices, healthcare facilities, nursing homes, mold and asbestos abatement and any other small to large square footage space that requires portable air cleaning. 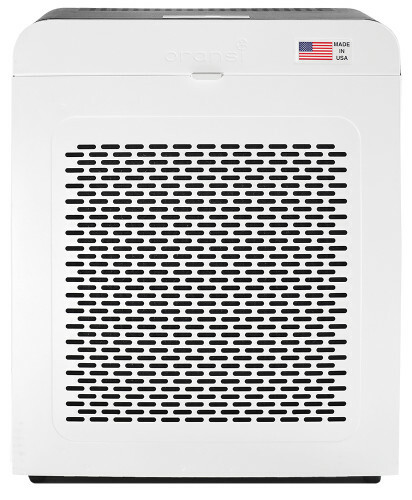 The EJ is super quiet - in fact the quietest air purifier on the market for the given air flow. And on the lowest fan speeds we could not detect any sound in the sound chamber testing. Where Are the Key Parts Made? 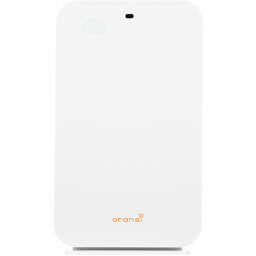 Oransi air purifiers are used by some of the leading companies, medical centers, government organizations and universities. We are delighted to be able to provide clean air to so many quality organizations. What was your primary air quality concern? The air purifier workers great but is noisier than I was expecting. inter snow storm. It was horrible. Every morning my husband and I woke with a stuffy nose. 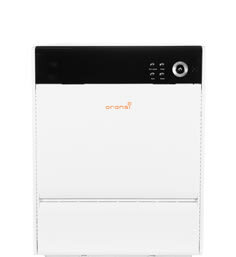 After much research on how hospitals keep operating rooms clean, I came across the name, Oransi. Desperate to improve the air quality and lessen the need for so much dusting and cleaning, I purchased two EJ120's. One is in our bedroom and serves a dual purpose providing white noise and clean breathing air to sleep to. The other is in our open concept kitchen, dining, and living room space. Great improvement in air quality in our house. Q: What is the cfm of the ej for all the different speeds? (5spds) Of course filter conditions change constantly. Do you have numbers for various conditions? How much difference with the new pre-filter? A: The CFM by fan speed is 1: 70 2: 100 3: 135 4: 200 5: 331. These are tested with clean filters. There is no standard for testing with clogged filters and the CADR testing is only done at the highest fan speed. The pre-filter makes no difference, it has the same pressure drop as the original carbon filter. 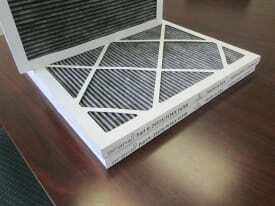 The optional pre-filter has very little air flow resistance. Q: I have smoke in the house , is this machine working clean the smell and clean odor out? A: It will help to remove smoke odors however if you have a deep smell odor in your home that has been absorbed by the carpeting and furniture then an air purifier will only help somewhat. Q: Will this be a good replacement for a kitchen range hood? Trying to have a portable way to vent my portable cook-top since we are not allowed to have a 2nd kitchen downstairs. A: A ventilation system like an ERV would be better. The EJ120 will clean the air and reduce odors however it does not ventilate the air to the outside. Q: A follow up question about wattage. You say you have introduced a filter to slow down the EJ120's motor to pull just 52 watts. Is that filter usable by the EJ 220? Secondly, you mention using a pre-filter on the EJ models to prolong the HEPA filter in dusty environments. 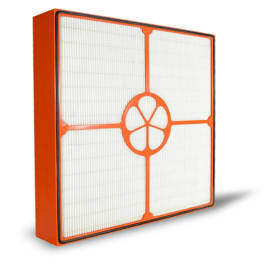 Does this pre-filter replace the carbon filter, or does it fit in the EJ models along with the carbon filter? And, if it does have to replace the carbon filter- will that then change the watts that the EJ pulls? Thank you. A: Yes, the new pleated carbon filter can be used in any EJ model. The pre-filter is an optional filter that is used in addition to the carbon filter. It doesn’t impact the wattage. Q: My house is approx. 1,000 sq ft total. This includes 2 bedrooms, bath, kitchen and living/dining area all on one floor. 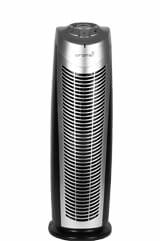 Would the EJ120 be able to effectively clean the air in my whole house given it is less than 1,600 sq ft? Or, is it better to have separate, smaller purifiers in multiple rooms instead? A: With all of the different rooms it would be better to go with multiple smaller air purifiers. If the bedroom doors are closed they won’t be getting cleaned and that’s where many people spend a good part of their time at home.